Lobster Clambake Dinner for Six! Home > Mother's Day Dinners! > Lobster Clambakes! 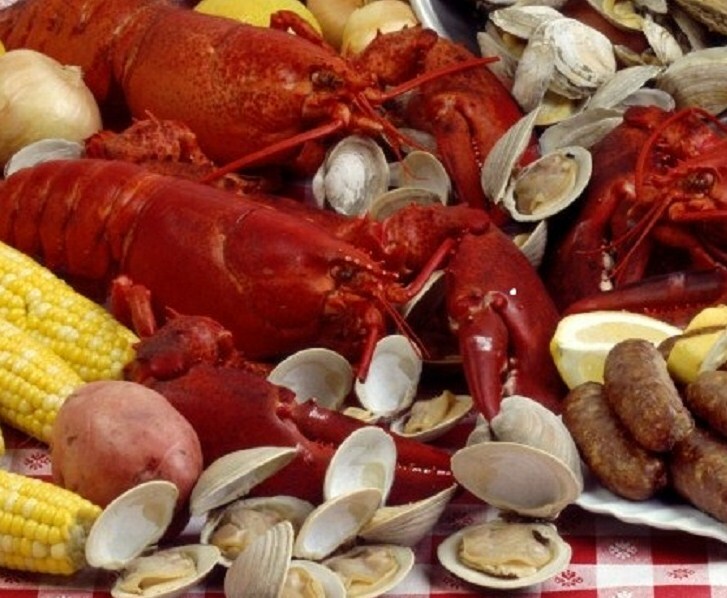 > Lobster Clambake Dinner for Six! Enjoy one of our most popular items, one that will get both of us rave reviews! This package is sure to please any seafood lover! The Lobster Clambake for Six! Folks, This is a TON of Food, all in it's own cooking pot!Just Add Water And Steam, That's It! Our Clambakes Are Also Great For Tailgating At The Game! • Six 1-1/4 pound Live Maine Lobsters; • Six Quarts of Little Neck Clams; • Six pieces of Sausage Wrapped in Flounder Fillet; • Six Servings of Red Potatoes, Sweet Potatoes, and Onions; • and Six pieces of Corn on the Cob! It's all in its own cooking tin with instructions and also includes six complete Lobster pick sets! Great for Parties, for Tailgating at the game, Anniversary Dinners, or a Great Lobster Birthday Gift Idea! Order This Incredible Lobster Clambake Dinner For Six By 10 am EST, And We'll Ship It To You Overnight In Time For Dinner Tomorrow, Right In Your Own Home! 5 of us went to visit a friend who now lives in Florida. We ordered the clambake for 6 for a surprise for her. It was fantastic!!!!! We are all still talking about it!!!! Loved that it came packed in a tin and all ready to cook. So easy, and there wasn\'t much of a mess to clean. All went back in the tin!!!! Left more time for us to visit and have cocktails!!!! Ordered this for our family Christmas dinner. Was a little nervous since it was delivered Saturday and Christmas was Monday. Followed the storing directions and the lobsters were moving and everything was fresh when we began to cook the dinner. Everything turned out fantastic! Seafood was fresh and tasty and the corn and potatoes were wonderful! It was a huge hit! Thanks! Wow! We ordered the clambake for 6, chowder & large shrimp for our birthday/Father's Day family celebration. It was a giant hit with everyone, including the grandkids. There was very little left over - we just couldn't stop eating all the delicious seafood. Great customer service, easy to cook. We'll be back for sure! Full ! and Leftovers ! How did you pack that much food into that can? It was OUTSTANDING! Great products, we are talking about doing this again really soon! This was one of if not the best ideas my husband had for Thanksgiving. You came highly recommended, and I see why! Wow,what a feast! 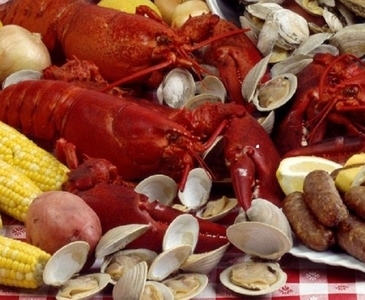 have used the lobsterguy.com now for 5 years running for our 4th of July clam & lobsterbake! It is ALWAYS a hit, and the products are always top notch! Hint: order extra clams - they always go fast! --Mary-Jo F., S.C.